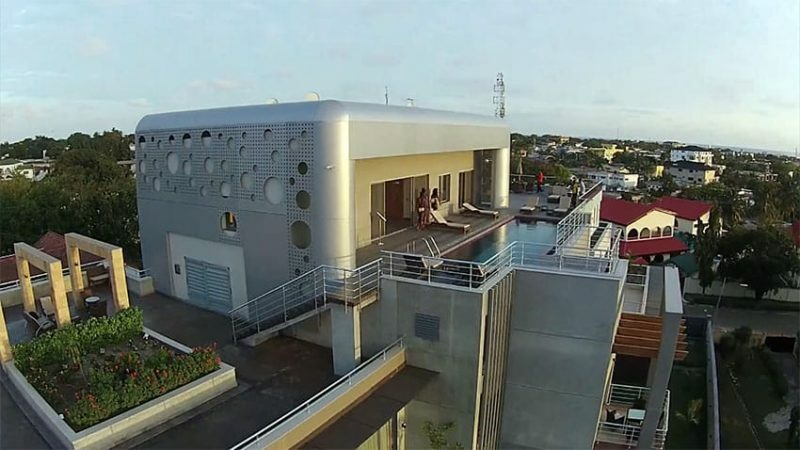 This modern rooftop apartment design with swimming pool features beautiful architecture with a unique style. Created by Key Architecture Group it is the ultimate spot for relaxation and entertaining. With terraced outdoor patios, water features and sun decks this building showcases luxury amenities for an upscale lifestyle. 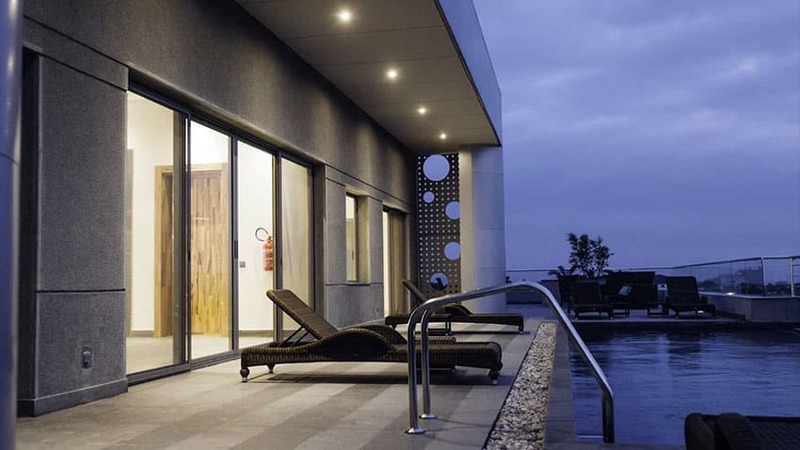 This modern rooftop apartment is equipped with a recreational swimming pool fit to be used by any and all residents and guests of the apartment. 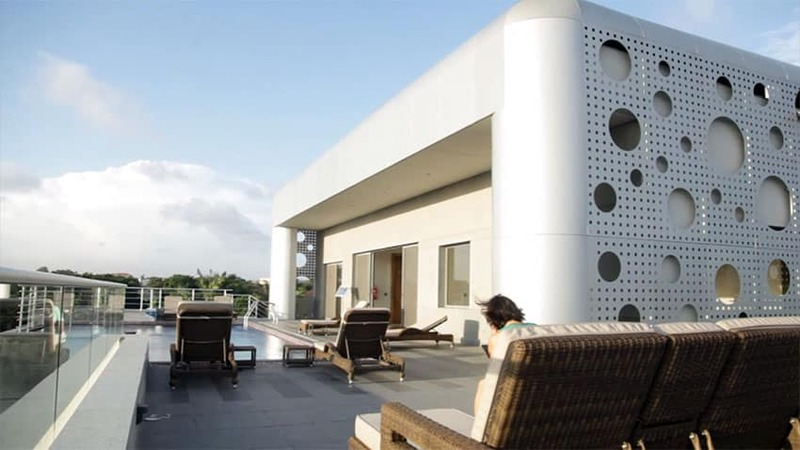 The numerous lounge chairs situated around the roof deck can also be used for quiet personal relaxation. 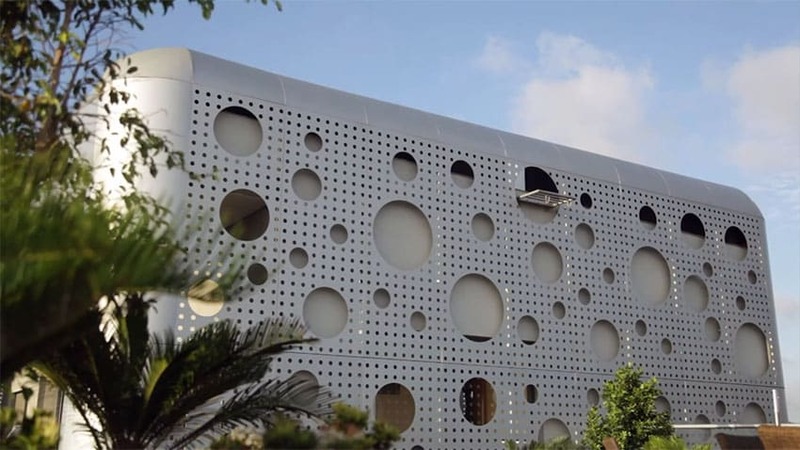 The unique perforated wall cladding has random circular patterns that serve a two-fold purpose – for aesthetics and for amply sun shading. 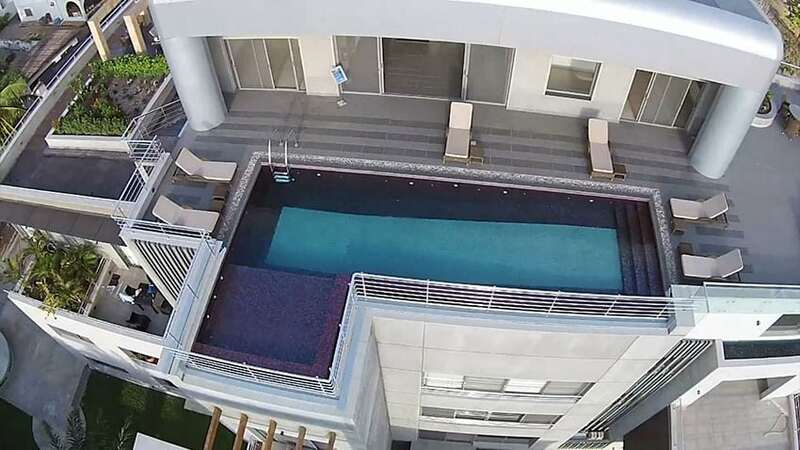 The roof top apartment not only boasts its amazing pool lounge area, but also a quaint little roof garden connected to the outdoor pool are through stairs. Located at a a different level as the lounge area, the roof garden serves as a fresh pop of personality to the otherwise barren roof deck. The apartment itself opens up to its outdoor area through large glass sliding doors with a large roof overhang to help with shade and the elements. The use of full-sized glass sliding doors makes it so that even when the doors are closed, the full benefits of a stunning rooftop view and ample daylighting are still provided. The L-shaped pool features different levels of depth and has both an access ladder and steps that lead into the shallow side of the pool. 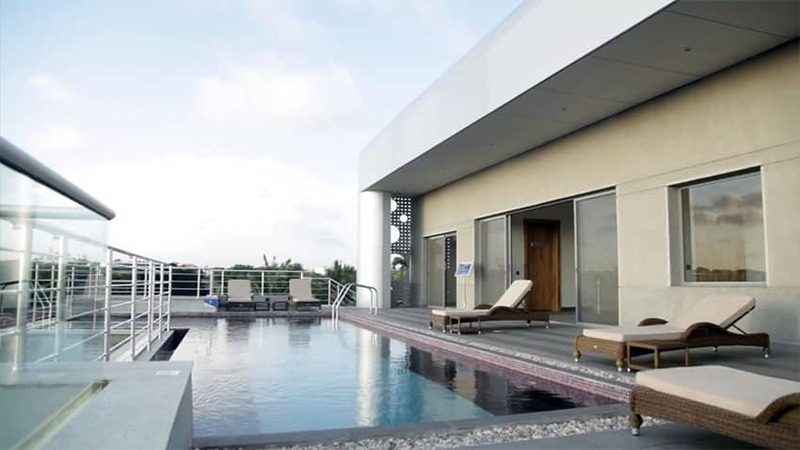 A small lounging area is connected to the main part of the pool and juts out of the building footprint to provide complete panoramic views that can be seen from the rooftop. 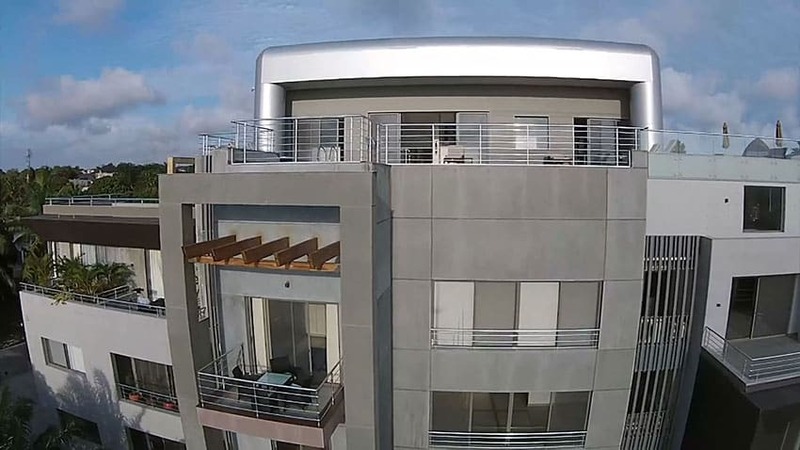 This project was designed and built in Ghana, Africa and was done by the Key Architecture Group. The client, INFINITY, specializes in real estate, specifically with luxury apartments such as this one. 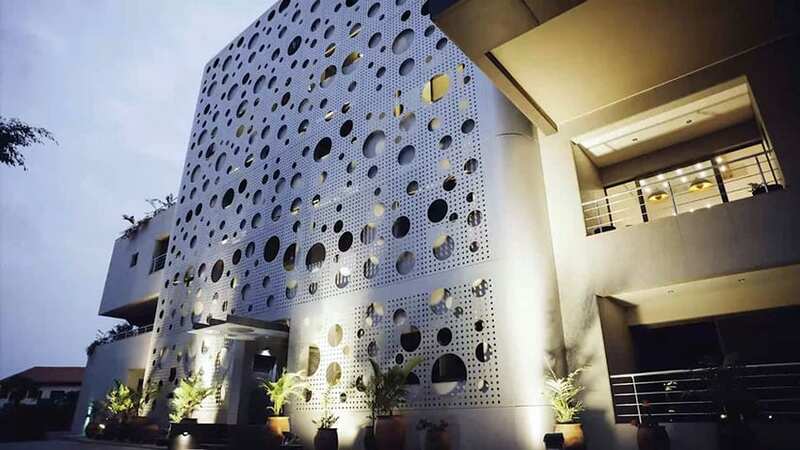 The building’s exact location is in Labone, Accra, Ghana, and Key Architecture made sure that this project was a turnkey one. 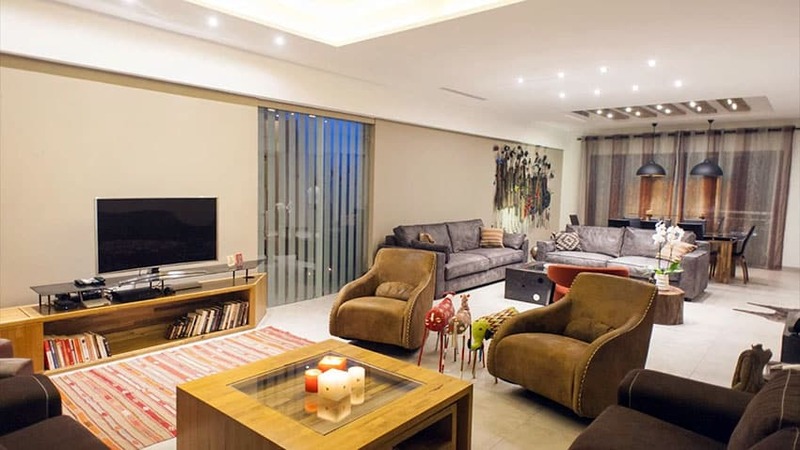 In this example, we have the decorated apartment’s living room. 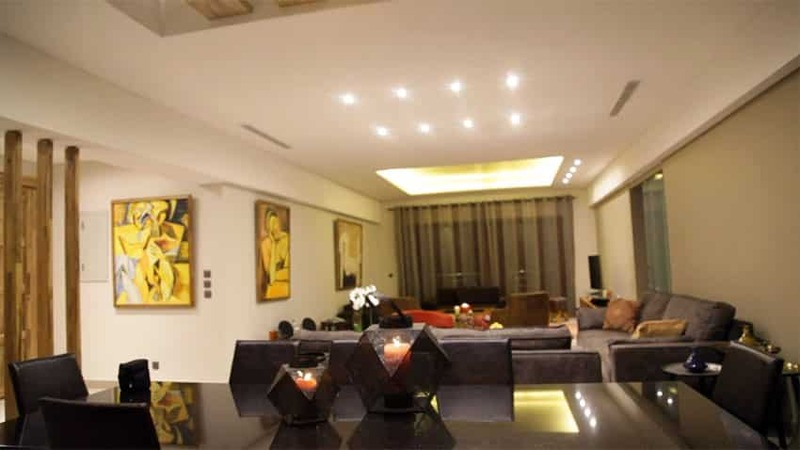 The interior design is more colorful yet just as stylish as its exterior facade. 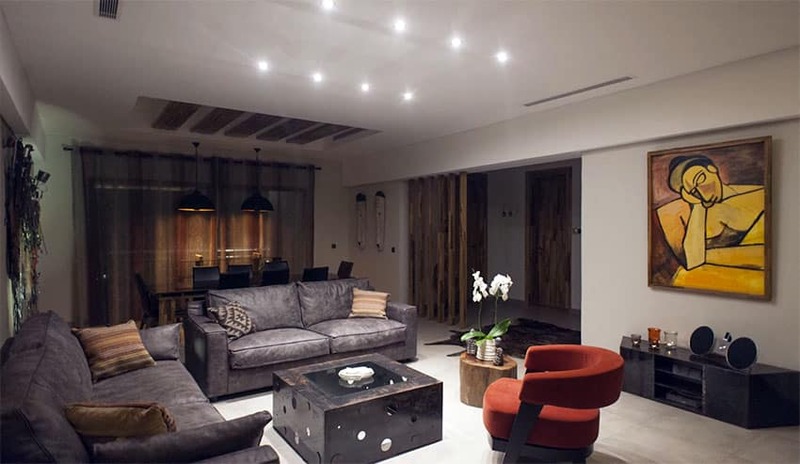 The use of soft earth tones in the form of wooden console and coffee tables as well as brown lounge furniture is complemented by the general brightness and whiteness of the room. In true African design fashion, the elements used in the interior spaces reflect the region’s unique culture. Various wooden masks and hung painting are seen on the wall – this gives the room some unique character. The couches used are Lawson style gray lounge sofas. And the style of the side tables, coffee table, and red lounge chair are contemporary. 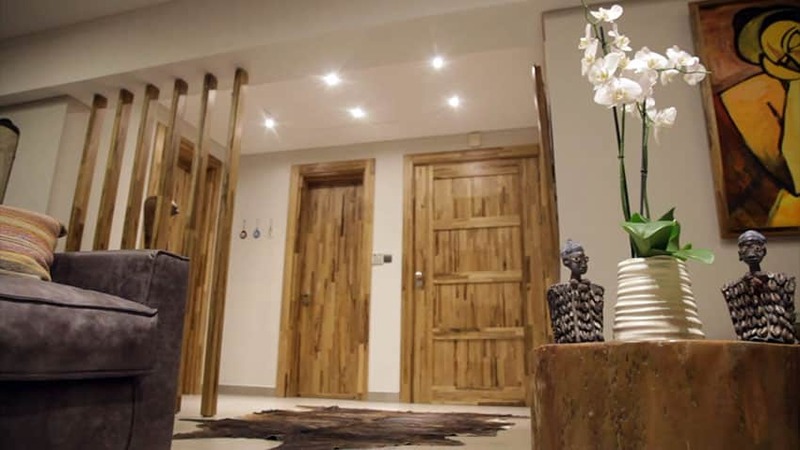 The use of wood in this home reflects the warmth and welcoming nature of the native culture. In this closer view, we also see other cultural table-top decors as well as stylish animal skin rug near the door. The use of wooden vertical louvers separates the hallway area of the home with the main living space. Ceilings very often make or break the spirit of a space. The designers made it a point that the warm brown wood motif of the home doesn’t only stop with the doors, louvers, and furniture. 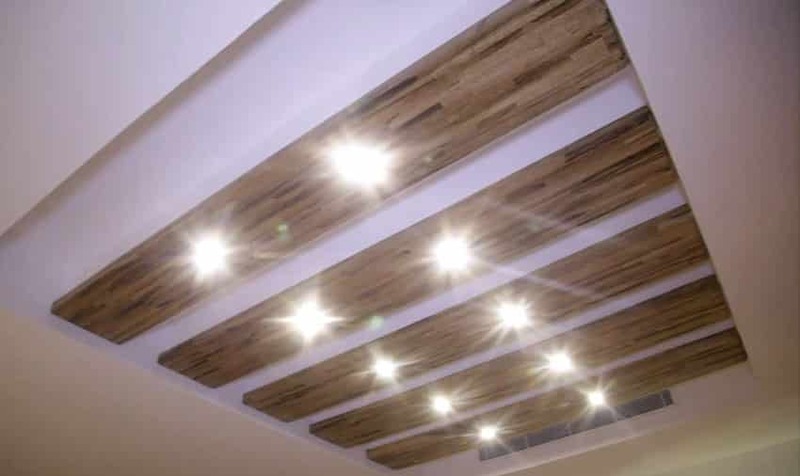 Here we see that even the apartment’s custom recessed lighting are integrated into wood slats and positioned with the tray ceiling. 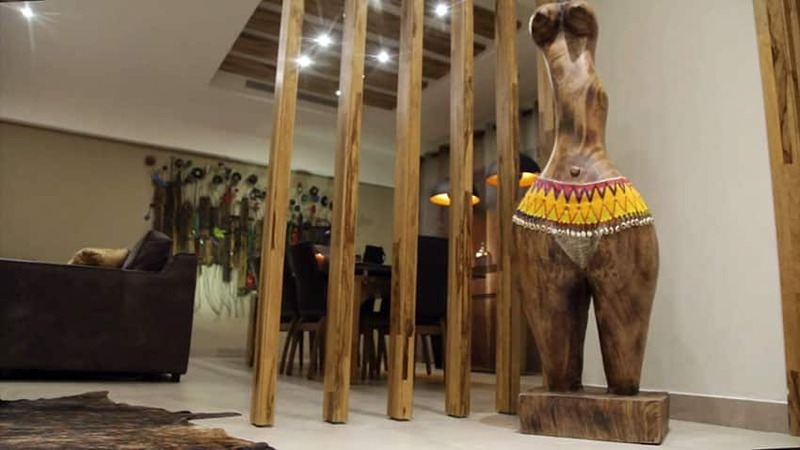 The different African decor speaks volumes about the client and the designers. True blue Ghana pride is shown in the wooden sculptures, wall-hung art choices, and even the choices of construction and finish materials. Good design also considers lesser thought about elements such as lighting fixtures and ceiling design. 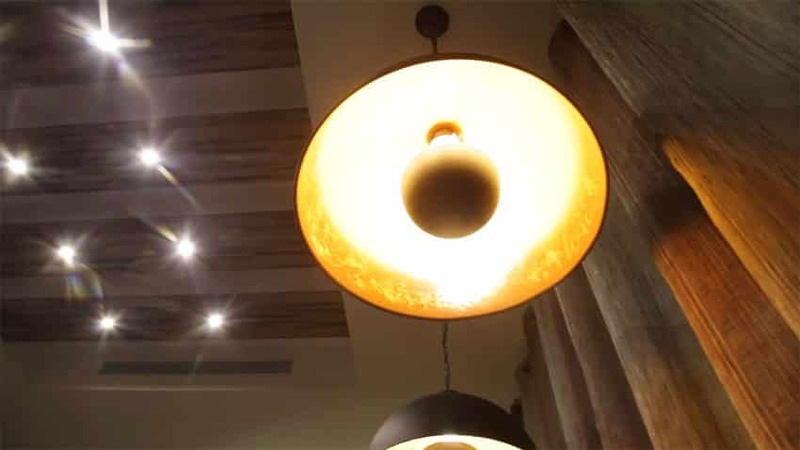 This worm’s eye view perspective of the hanging and ceiling lights above the dining able shows how big of an impact lighting design has on homes, especially with important areas such as the dining room and living room. This full view of the dining table and lounging-living space really lets you see the full extend of the stylishness of this piece of interior design. The sleek use of solid black and white color palettes, with hints of lighter and warmer earth tones, really make the space and give it a bold character. 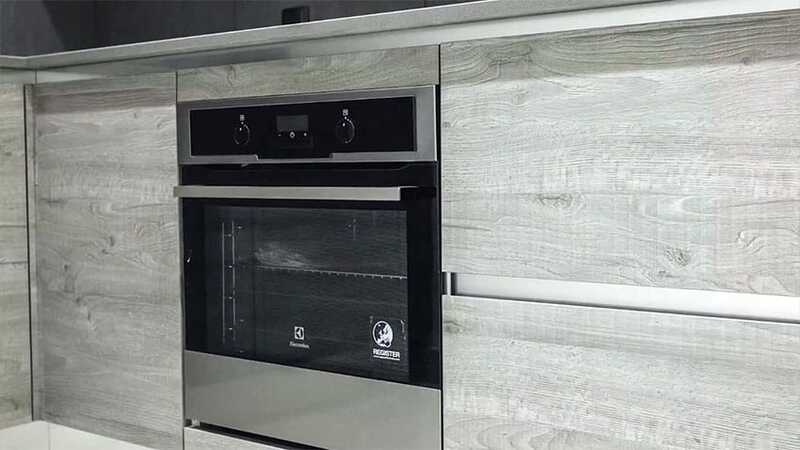 This close up of the kitchen cabinets in the apartment lets you see that not only a single shade of brown and type of wood was used for the wood design elements of the home. The raw wood doors of the kitchen cabinets are of an ashen gray color and have very well-defined wood grains that show through. 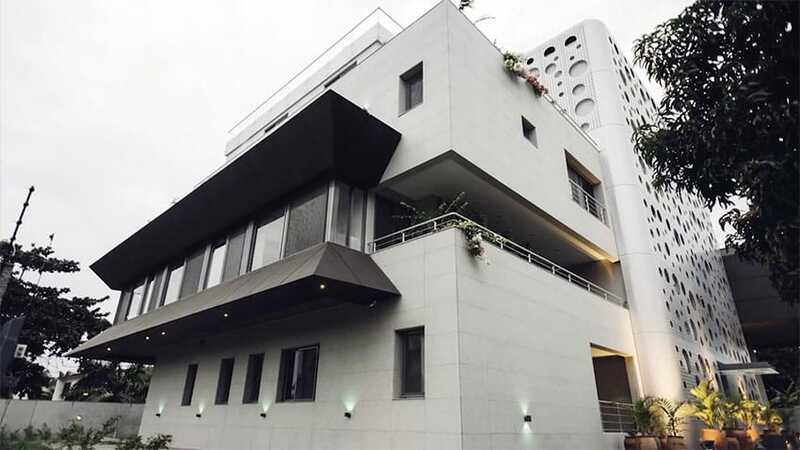 The circular design of the building facade really makes its mark in the area that it’s in – who would forget such as simple yet strikingly bold design? To increase thermal protection, as is important in regions such as Ghana, the material used was a reflective and heat-insulating metal material. The holes also permit cross-ventilation. This custom-designed modern apartment makes good use of various cantilevered roofs to maximize the floor area of the apartment, which caps in at 4,360 m². The cantilevered area was done in a different color to the rest of the white cladding of the house. This creates some good contrast and scale to the form of the structure. 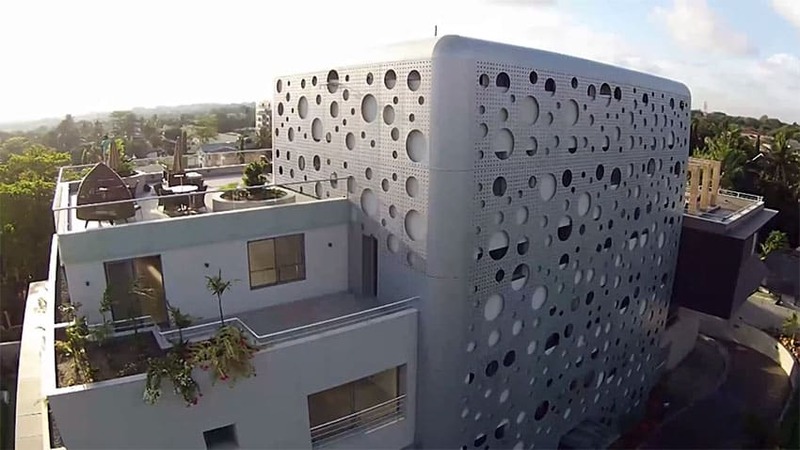 The main core of the building is surrounded by the aforementioned perforated building skin with unique circular patterns. In this view, we see that also the personal back balconies of the home also has landscaping and gardening. Amidst the sleek yet cold style of this modern building, we are still given nice little oases around the house. Sleek and segmented rectangular forms were used for this project. Minimalist and modernist, this rooftop design is elegant, sleek, and undeniably aesthetically top-notch. Segmenting the house like this also lets the design communicate the different types of spaces on the inside. For example, the cladding of the bedroom areas are different with each floor and the core or middle of the building is also of a different gray material. Viewing the building from the first floor, you are greeted by an amazing view of the building facade. 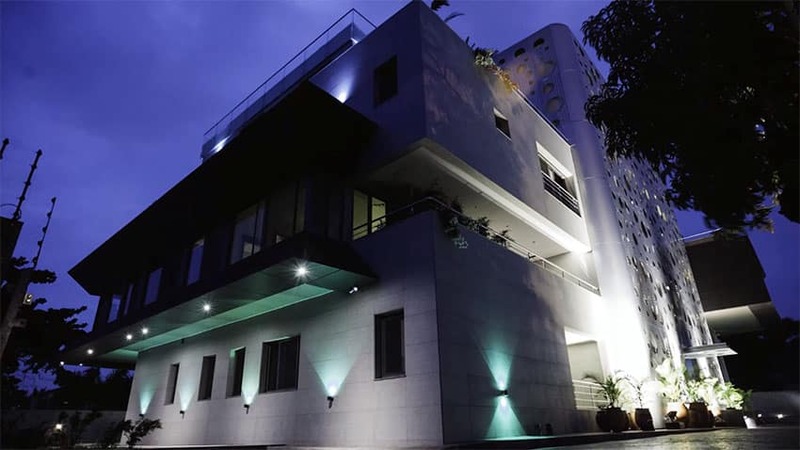 And if you are lucky enough to visit at night time, amazing outdoor lighting design enhances the effect even more. Quaint hints of landscaping can also be seen all around the outside of the complex. At night, we are treated to an almost totally different scene as with during the day. Modern green-tinted outdoor-grade sconces were used to illuminate the beautiful facade of the house. The harsh contrasts between the lit parts and the shaded parts really gives this building a whole new character at night. The modern rooftop swimming pool area is also totally different at night. 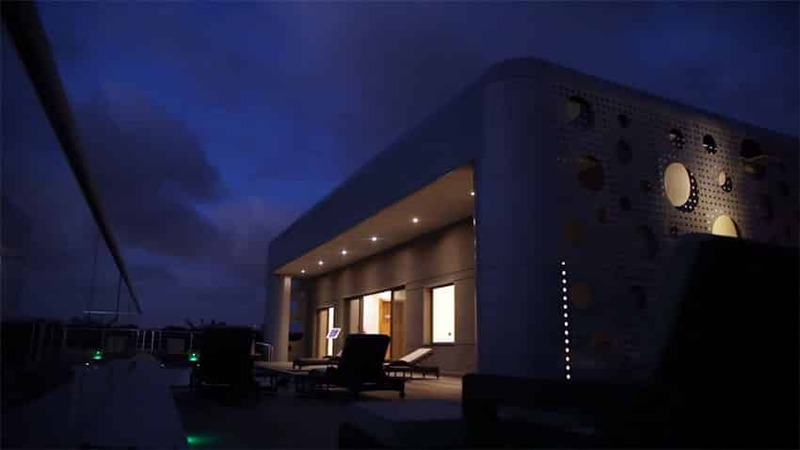 Subtle pin lights are located on the roof overhang near the sliding door and the perforated facade surface itself also has its own focus lighting so as to make sure the beauty of the facade is also appreciated during the night. 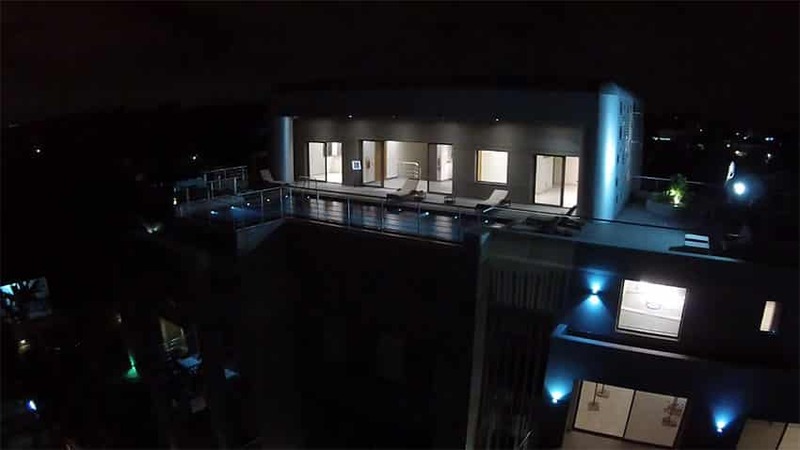 Another view of the amazing lights at night, this type of configuration also makes it so that the beautiful skylines and night views can be more than adequately be enjoyed at the pool area. The same blueish greenish tint can be seen with the outdoor lights of the pool area. 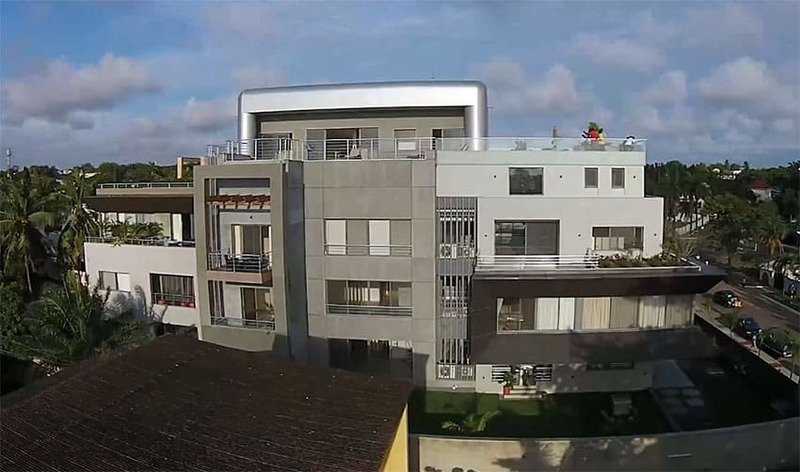 In all, this luxury modern rooftop apartment design in Ghana is a perfect urban getaway for those who are looking for some peace and quiet in the busy city. The almost seamless transition between the interior living are and the outdoor pool and lounge space really makes the home feel large and spacious.